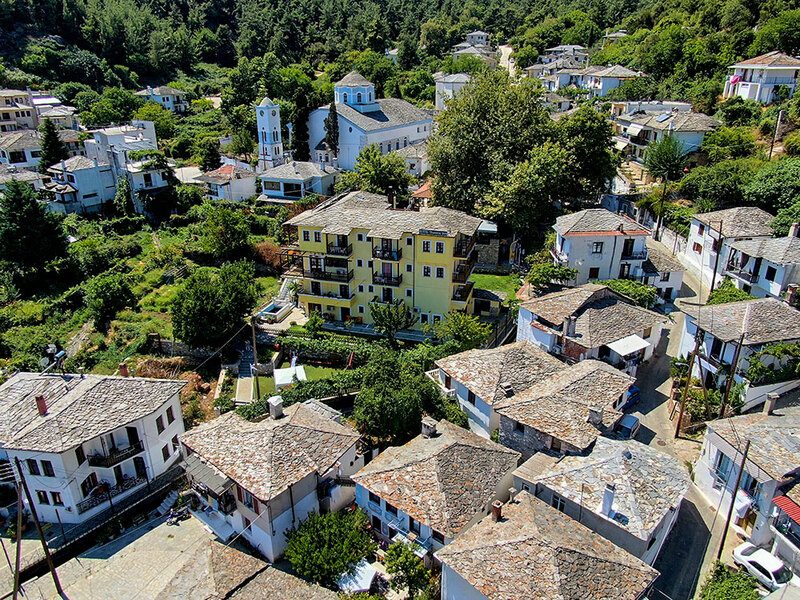 Panagia is a traditional village with a rich history but also with many unknown facts. This is one of the richest and most important villages of the island. It was built about 300 years ago, but during the Byzantine period there was a place which had the name "Anastasion". We do not know when it got its present name. Shortly after the revolution of 1821, it became the capital of the island. The location of the village, a narrow gorge on the sides of the mountain, is making it invisible from the open sea. The houses have covered balconies (sahnisia), slate roofs and at the interior there are wooden walls. The church of the village is large and is built from ancient stones. Both the name of the village and the existence of 11 chapels indicate the intense religious status of the inhabitants. We can distinguish the St. Athanasios chapel, built in 1818, the chapel of St. Constantine and Helen, Saint Charalambos, built in 1820, St. John the Theologian, built in 1825, Saint Panteleimon, of Saint George built in 1835 and the Chapel of Panagia which was built in 1845. The church of Panagia, which is directly linked to social and economic life of the village, is very important. The history of this temple is directly connected to the history of the village but with some gaps mainly starting with the years after the fall of Constantinople up to the end of 17th century. Unfortunately, the exact date the church was built is unknown. But judging by the fact that the village got its name from the church name, then it should be prior to 1821, the year of the Greek Revolution. The church, according to tradition, was consecrated by the Metropolitan Bishop Anthimos. 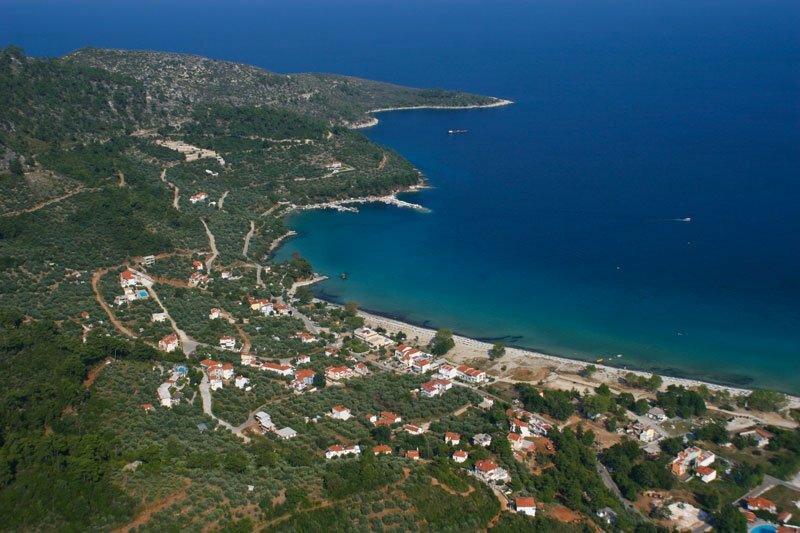 In the 18th century, the inhabitants of the ancient city of Thasos were forced, because of pirate raids, to flee to the central part of the island and settle in Panagia therefore the residents came to Panagia in 1770, when there appeared the Russian fleet. Thus the population of the village has significantly increased and therefore the necessity for a bigger church appeared. Works began in 1831 under the supervision and work of craftsmen from the city of Kastoria who knew well the ecclesiastical architecture. The building works have started due to the financial aid of the notables Sotirios Avgoustis Avgerinos and Konstantinos Hatzis, whose tombstone is around the churchyard. But because the funding was not enough for completing the magnificent temple, they sought help from the Mount Athos. The monastery that helped was Vatopedi, which was the most wealthy. Thus, the church was built without the roof. In 1881 it was finished along with the new wooden iconostasis, created by craftsmen from Volos. The workers from Kastoria, gave the church many features of Byzantine churches in Kastoria. The dome is elevated and octagonal. The niche of the altar is also octagonal semicircle. Its length reaches 27.50 meters, width 18.60 while the height is 18 meters. The walls are built with marble from quarry of Panagia. 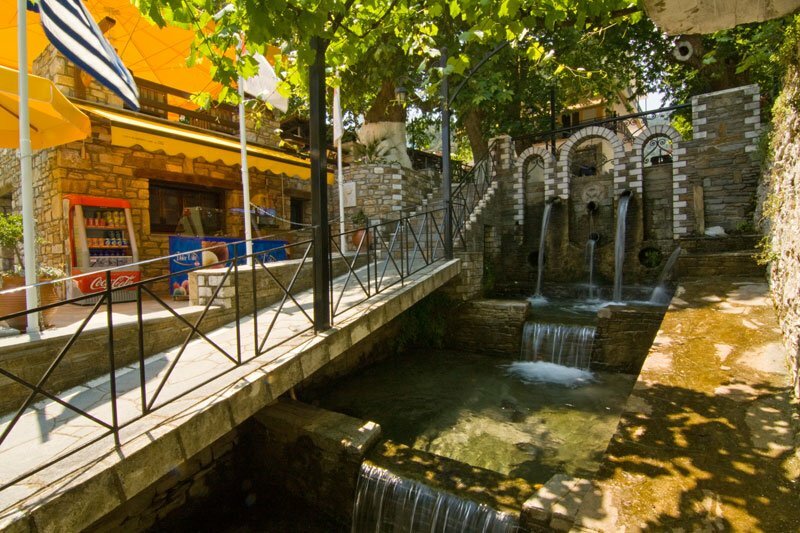 Noteworthy is also the fact that the walls are made by marble stones from the ruins of ancient temples of Thassos. The architectural style of the temple is a basilica with a dome with three aisles and interior semi cylindrical vaults. 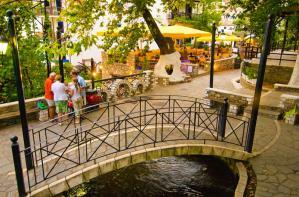 The village has plenty of running water and the huge plane trees shadow the plaza. Also the view of the village to the mountain and to the sea is wonderful. 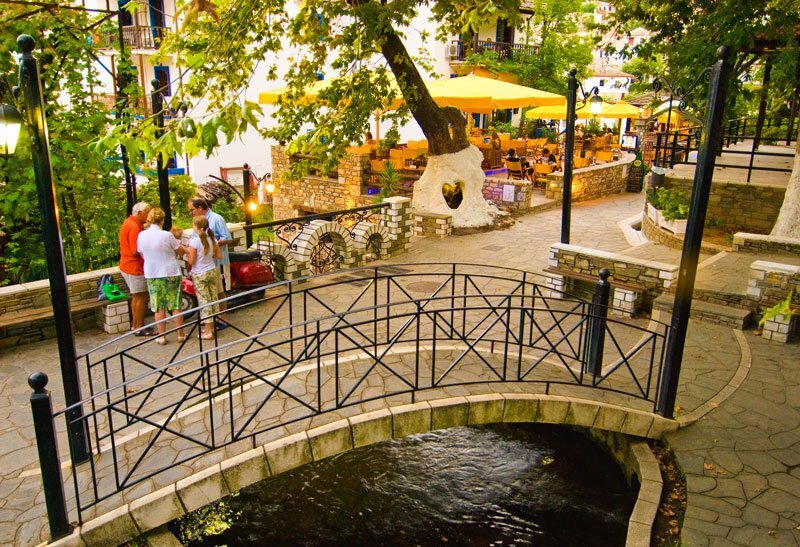 In one quarter of an hour of walking , we arrive at "Drakotripa." It is a cave with stalactites and stalagmites, but not explored in all its range and in all its depth.